This policy brief interprets the findings of a new study by CE Delft that shows how energy-intensive companies in 19 European countries have massively profited from their pollution because they are deemed to be at risk of “carbon leakage”. “Carbon leakage” refers to a hypothetical situation where companies transfer production to countries with weaker climate policies in order to lower their costs. Under the current EU Emissions Trading System (EU ETS) rules, industrial companies that are believed to be at risk of “carbon leakage” are awarded free pollution permits. Free allocation has resulted in significant windfall profits for corporations. Windfall profits occur when industrial companies are over-subsidised for their pollution. This can happen from receiving too many free emission allowances that can be sold for a profit in the market, from using international offsets and from making consumers pay for non-existent carbon costs. Energy-intensive companies made over €24 billion from the EU ETS during 2008-20142. Most profits were made in Germany, the United Kingdom, Spain, France and Italy. European taxpayers are picking up the bill as governments forego income and lose out on revenues from auctioning these pollution permits. As a result of free allocation, less money is available for investments in the climate friendly transition of the European economy. In the 2008-2014 period, governments have given out 11 billion free pollution permits and have thereby missed out on at least €137 billion in auctioning revenues. Without an urgent change of the rules, emission reductions of industry will stall over the next 15 years. Giving away free emission allowances reduces the incentive of companies to produce more efficiently or to invest in breakthrough technologies that reduce CO2. The Paris agreement will level the playing field across the global economy after 2020. When relocation destinations have similar climate policies to the EU ETS, there will be no “carbon leakage” risks. Studies have furthermore not been able to find evidence for “carbon leakage”. The ongoing legislative process to revise the EU ETS rules for the post-2020 period provides an important opportunity to revise the current “carbon leakage” rules. The lessons learned so far are important to ensure that further windfall profits at the expense of taxpayers are avoided and, instead of subsidising pollution, European governments will invest in innovations that lead to low-carbon societies. Phase out the free allocation of pollution permits by gradually increasing the share of allowances to be auctioned from the current 57% to 100% in the future. Introduce a tiered “carbon leakage” approach and target free allowances only to those that really need it. The left-over free allowances should be cancelled or auctioned for innovation support. Annually reduce the amount of free allowances that an installation receives (the benchmark) in line with the overall decarbonisation pathway of the EU ETS. Invest more auctioning revenues in climate friendly innovation and support the frontrunners that want to invest in breakthrough technologies. 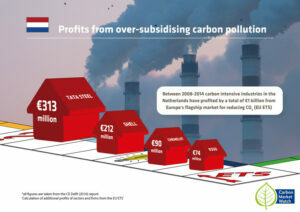 Hey Buddy!, I found this information for you: "Industry windfall profits from Europe’s carbon market". Here is the website link: https://www.duurzaam-ondernemen.nl/industry-windfall-profits-from-europes-carbon-market/. Thank you.